Kamari is one of the most popular resorts in Santorini. 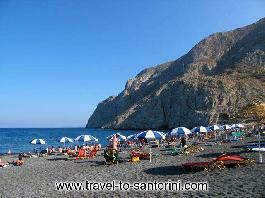 It is 10 km from Fira and distinguishes for its touristic infrastructure. Kamari’s beach is one of the most famous beaches in the island. It has black pebbles, it is organised and stretches to Monolithos. There are a lot of hotels and rooms to let. The choices for fun satisfy all sort of tastes. Taverns and coffee houses can be found along the coast line, while in the bars you will have the time of your life. While you are in Kamari you can also visit the archaeological site of Ancient Thira. A very important sight of this region are the excellent Byzantine frescoes in the Episkopi church that dates back to the 11th century.